That sounds so Nietzsche-esque, but I’m not waxing philosophical. It’s scientific reality. Dirt is devoid of life, of all-things nutritious for the flora that rely on it. Soil, on the other hand, is alive. 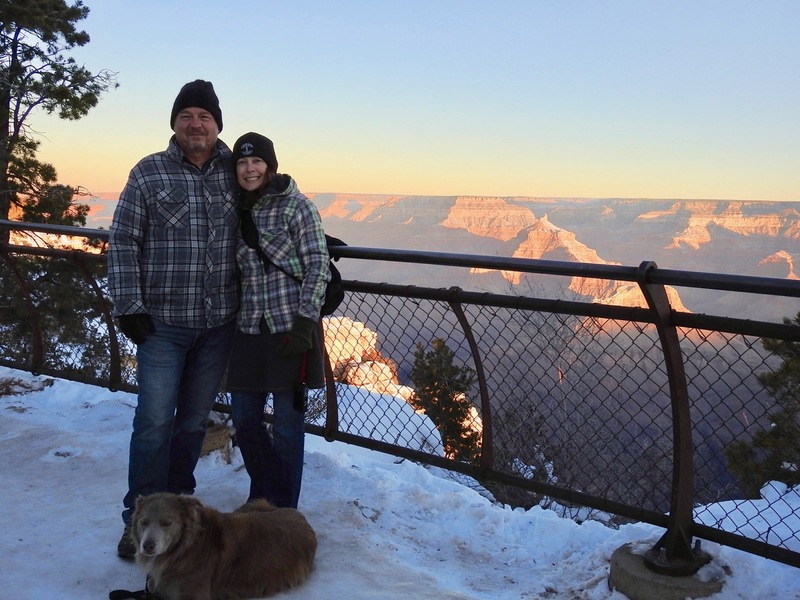 A recent conversation with Dr. Elaine Ingham, Soil Scientist and President of Soil Foodweb, Inc., enlightened me to the other world that lives beneath our feet. 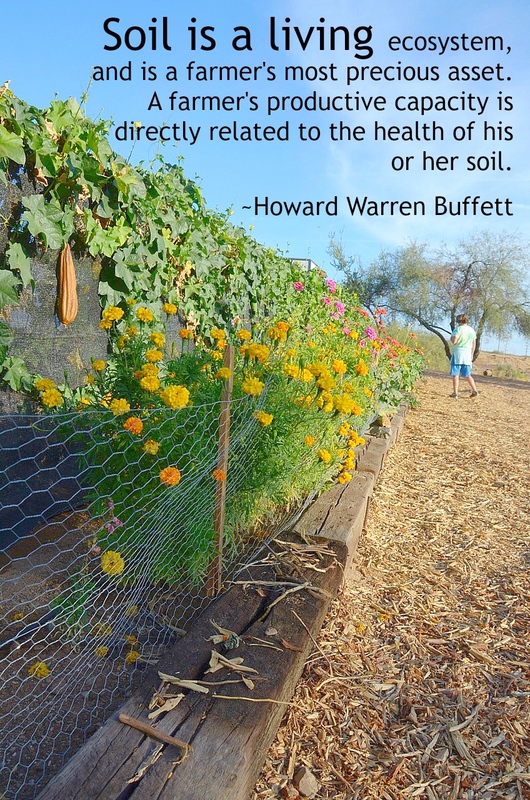 Soil is rich with life. It has communities with billions of microorganisms—a natural biology of bacteria, fungi, protozoa, and nematodes—that interact with the entire ecosystem to protect and feed plants while building soil structure so roots grow deep. These microorganisms can decompose chemicals in the soil that are toxic to plants. This is the soil food web, and when these communities of microorganisms are present, plants will be healthy and productive, and healthy plants support the life above ground from pollinators to humans to the entire natural world. Back to dirt. A vast majority of US homes have unintentionally reduced their soil to dirt, due to the practice of applying synthetic fertilizers and pesticides that smother the natural life that would otherwise be in great abundance. Dr. Ingham’s description of the unhealthy current state of affairs versus the healthy soil food web sounds curiously similar to a sci-fi battle of good versus evil. The good is the natural biology of bacteria, fungi, protozoa, and nematodes, the microorganisms aka tiny critter warriors that are found in healthy soil. The villains, synthetic inputs like fertilizers and pesticides, specifically herbicides and insecticides, battling and killing the natural life that would otherwise be in great abundance. An unfortunate downward cycle is born. Weary microorganisms lose battle after battle. The more the soil dies from toxic inputs, the easier it is for pests, diseases, and weeds to settle into that space thus requiring an ever-increasing amount of inputs to maintain a lawn or garden. With only a few simple steps and a short amount of recovery time from the toxicity, one can give the critter warriors a chance to create healthy soil in which the natural output is nutrient-complete vitality. A healthy environment can be inexpensive and easily obtained when we let nature do the work for us. 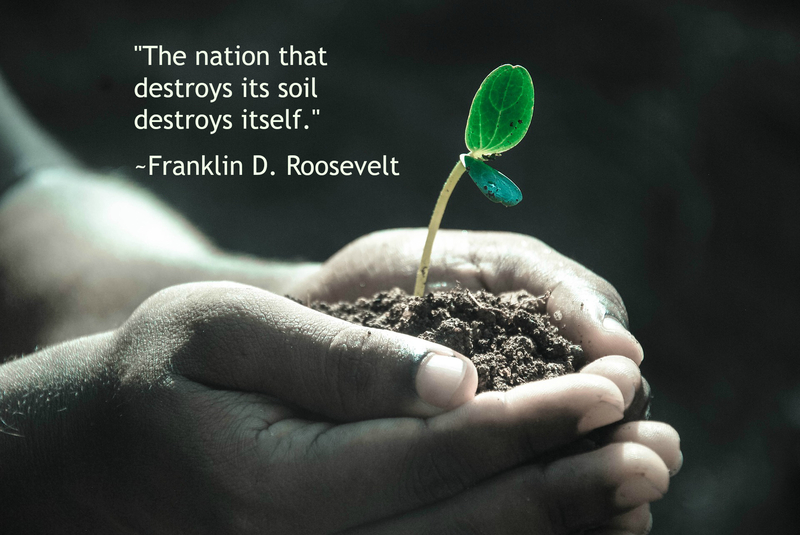 Soil, with its ability to support all plant life while cleaning the air (through carbon sequestration) and filtering water, to some, is considered the very foundation that supports all life. Parasites, pests, and weeds grow better than crop plants in spoiled soil aka dirt. Folks then reach for the pesticides, and round round round we go stuck in a trap of perpetual toxic chemicals. Many homeowners take the toxic route because it seems like the most convenient and cost-effective way to manage their properties. Dr. Ingham enlightened me by sharing that the toxic way is not the most convenient or cost effective method in the long run. Quite the opposite when one factors in the countless health costs from the decline of beneficial insects like our pollinators to diseases our companion animals get walking across a lush, toxic lawn, to our own health costs. Children are more susceptible to physical and neurological diseases when exposed to these toxins, and studies are showing a connection of synthetic pesticides to diseases like Parkinson’s and Alzheimer’s. The risks far outweigh any benefits. The presence of the soil food web is critical for pollinator health. “Pollinators are not a whole lot different from human beings. What makes us healthy? It’s the food we eat. If plants don’t have the nutrients in them, then we’re not getting the nutrients we need. We won’t be healthy, we’ll be sick with pests and diseases and will have to take our amendments (drugs or supplements) in order to try and stay healthy, but nothing is ever done in balance. Go back 200 years ago, people weren’t popping nutrient pills or vitamins. They were just eating a good healthy diet. All the plant materials and animals had the proper balances, because they weren’t destroying their soil. If we’re eating plant material that has all the right biology, bacteria, fungi, protozoa, and nematodes, they re-inoculate our digestive system so we don’t make that toxic material that gets taken into our blood stream. Pollinators require two essential components in their habitat: somewhere to nest and reproduce and food –flowers from which to gather nectar and pollen. Is There a Way to Recover from the Abuses of Synthetic Inputs? If folks stopped using the inorganic fertilizers and pesticides, how long would it take their lawn or property to recover? The answer may surprise you. Dr. Ingham claimed it would only take one to two months to recover using biological inocula, which is a fancy term for compost. Specifically, properly made compost where it remains aerobic throughout the whole compositing operation. One can use compost extract or tea and spray it directly on a lawn, in vegetable boxes, or on the soil before sod is placed. Because the plants are putting the roots into that material where the bacteria, fungi, protozoa, and nematodes are building structure, the roots will go deeper into the soil faster. This, in turn, equates to less watering, which will save even more money. Locally, here in Southern Oregon, Biologic Crop Solutions has free compost tea Tuesdays. This makes the process easy. Bring two 1-gallion jugs to Biologic Crop Solutions and fill them up. Dr. Ingham cautioned that when buying compost tea, ask the vendor if have they tested it recently and what are the balances of the organisms. The vendor should have a report of the biology. If your compost extract has the following concentrations or higher, you’re in good shape, and you’ll start seeing the results Dr. Ingham talking about. A couple of bacterial-feeding nematodes and fungal-feeding nematodes. Check out Rodale’s for information on making your own compost tea. This is what the food web does, and this is what Dr. Ingham is going to highlight during her presentation when she visits Medford on February 20th. Go to the end for more information. Is There Hope in this Toxic World? Dr. Ingham is optimistic that, yes, absolutely, there is hope. “We don’t have everything perfect yet, but do we have to strive for perfection? Nature isn’t perfect. So, as long as we start putting the proper sets of microorganisms, the aerobic organisms back out, the ones that were with the plant – that follow the directions of the plant – we could rapidly and very quickly turn things around. No! It’s simple to make your own. Let the worms do the work in a worm bin. You need about 10 pounds of worm compost per 430 square feet of lawn. Simply spread it over your lawn or double the application if plants are sickly or unhealthy. You can add it to water and spray it on. Just get out there and experiment. There’s no harm caused by adding organic matter to your plants or lawn. Then witness the magic of biodiversity. To learn more about Dr. Ingham’s work or to “get out of the toxic chemical trap” while learning the basics about soil life, sign up for self-paced, online classes. Save the dates for some stellar learning opportunities! Our Family Farms presents a 6-part series, The Future of Soil: Ensuring Resilient Food and Agriculture Systems. This monthly series from February – June will educate community members on best practices for improving and even regenerating soil, which in turn can alleviate climate change, improve crop or garden yields, and offer pesticides alternatives. Participants can register here for all 6 sessions for $60 or attend a single session for $15 with pre-registration or $20 at the door (based on availability). Learn what the indicators are that tell you when soil life is lacking. Find out where to get or buy or grow the beneficial organisms to put back into your lawn and garden. Understand how life – the soil food web – works, so you can maintain the habitat that supports beneficial insects and not the diseases, pests, and parasites that are a normal part of dirt aka dead soil.